3 Button Suits | 3 Button Mens Suits on Sale! 3 button mens suits that have an Italian style cut give the wearer a more composed look than you might find with other style suits such as a Double Breasted Suit. Don't get it confused for your classic 3 piece suit. It's not the same thing. ContempoSuits.com offers a fantastic selection of cheap, affordable and colorful Italian cut 3 button mens suits that just go great with Stacy Adams Shoes. When you need to look your best in the office world, Church on Sundays or even a Wedding, a 2 piece 3 button business suit is just the thing to wear to garner respect. 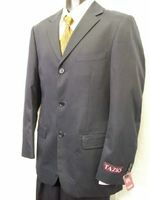 We always carry colorful 3 button cheap mens suits on sale in a variety of styles and bright colors to fit your budget. You cand also find the right 3 button Tuxedo to wear as well. From solid color Cheap Suits to Italian style pinstripe suits and other pattern style cheap suits as well. Perhaps you need a new mens suit for an interview, we have a huge selection of interview 2 piece 3 button mens suits for business. Most of our Men suits are of an Italian style design and fit. If you work in an office environment you simply can't go wrong with having several new suits that have 3 button jackets in your wardrobe. Our Executive Collection of 2 piece cheap suits including European style Linen Suits for men will make you walk with your Head held high. You don't need to spend a lot on Men suits for work and weddings when you shop at ContempoSuits.com. One of our best selling cheap suits year after year are these 3 button mens suits. We have these 3 button suits in over 20 fashion colors. If you don't own a single breasted 2 piece 3 button pinstripe suit yet, you seriously need to consider getting one of these Vittorio St. Angelo 3 button suits that come in four classic colors. You could be sipping cappuccino in Milan or just going to someones day wedding in a tan 3 button suit. Either way, you'll look great wearing this Italian cut 2 piece suit. What man doesn't need to have a Navy color 2 Piece suit in his closet waiting for him. Navy is one of the key colors for any 2 piece suit and this 3 button suit by Tazio will do your style justice. 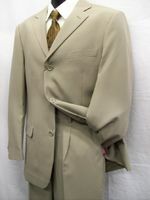 We specialize is selling nothing but the latest Italian style discount two piece suits that look great. 2 piece Business suits,work suits, call them what you like. You will be taken seriously in these beautiful hand tailored business 2 piece suits. Learn more about Suits for Men Here. You're going to love how you look in our two piece mens suits. Something magical happens when you put on an Italian cut suit. You can feel it instantly. Maybe it's just the way a suit jacket fits and feels different than other style suits. It's just something special. It's a pretty well known fact that people will look at you different when they see you in a Men suit. Here at ContempoSuits.com, you can find Italian cut 3 Button Suits in a huge variety of styles and bright colored. If you like your 3 Button suits that are colorful with pleated pants, we have them right here. If you want a 3 Button Suit in a pinstripe for that special wedding you've been invited to, we have those too. We have a 3 Button suit in pretty much any type of pattern and stripe combo you are looking for. If you're looking for a great deal on a Men's two piece Suit for Church or a Wedding, ContempoSuits.com is the place for you. Chances are you're going to need some new bright colored dress shoes for Men as well. Learn more about 3 Button Mens Suits. When the weather is cold outside, don't forget to shop for some Mens Overcoats Here. Shock the crowd with our Zoot Suits.